We appreciate your interest in the National Coalition of 100 Black Women, Inc., West Palm Beach Chapter. 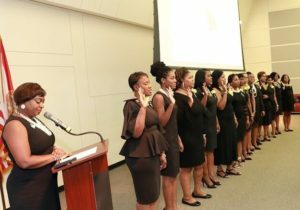 Any person who agrees to act in accordance with the purposes, aims, and bylaws of the West Palm Beach Chapter and the National Coalition of 100 Black Women, Inc. may become a member by successfully completing the membership process. We ask that you review the application process below. If you believe the purpose and aims of the Coalition provide a good fit for your personal and professional goals, please complete our Contact Us information form so that we may contact you during our next recruitment period. Submit completed application along with application fee. Receive a membership committee recommendation. Receive a majority vote from the body. Participate in the induction ceremony. Submit payment of annual membership dues and applicable fees.